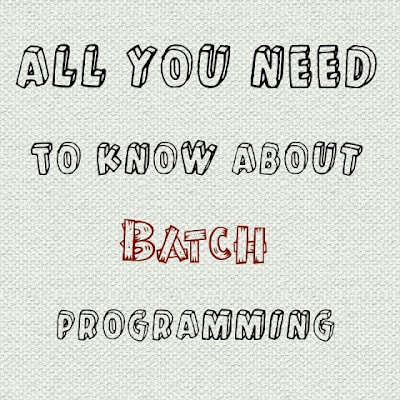 In This Chapter, we only focus our mind on Batch Programming. Basically batch is a scripting language which works in windows, DOS and OS 2 platform and can be programmed in notepad or simply in windows Command Prompt Shell. It Consist of simple commands to be executed by command line interpreter. The file extension type of batch program is “.bat”. 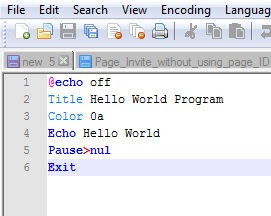 Below is the simplest code snippet for batch program which is nothing but a hello world program. After execution, this program will display “Hello world” on your computer screen. So you are newbie in batch programming and don’t know how to save and execute above program. Don’t panic, this tutorial will be your next milestone. We will introduce you with the simplest to the most hardest commands here. To save above program, just copy it and paste inside notepad. Then click on “file>save as” and name it as “hello world.bat” or anything you want. 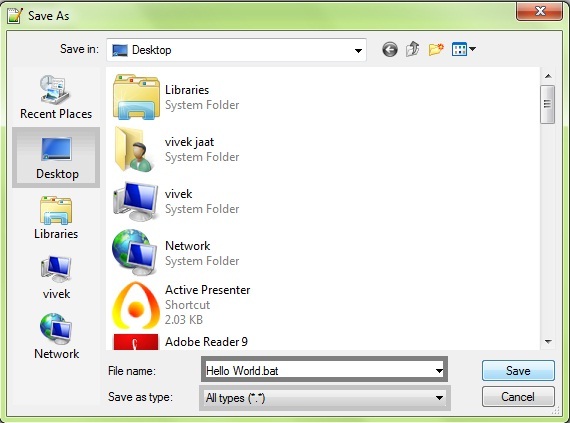 Make sure that you had used “.bat” after file name, because it the file extension type and your program will not work without it. After that Choose File Type as “all files (*. *)” and move to the location where you want to save it. Finally when you have done, Click on the program and it will display a text as in below picture. Note : We recommend You to use notepad++ instead of simple notepad as it is more responsive. Below are all the batch or command prompt commands that will definitely help you to get some new ideas. CLS Checks a disk and displays a status report. FORMAT Formats a disk for use with Windos.